I have pulled together information from many different sources and distilled the essentials of what you need to get started using Azure. You can download the table of contents that includes a listing of video lessons to see what the product covers. This product will continue to be updated over time and your single purchase will provide you will all the updates at no additional cost. I think this produce will provide the short cut many are looking to understand how they can start using Azure and what it is capable of. In this episode I’m joined my Melanie Gass, also known as the Microsoft Princess, from Centerpoint Solution to talk about the latest changes in Office 365. 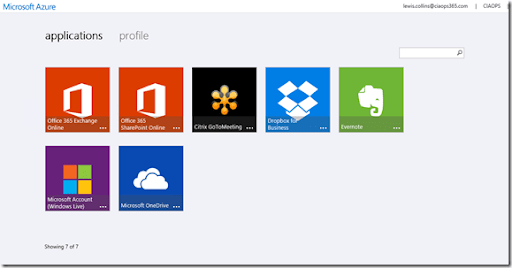 We look at the recent changes in Office 365 and how you can keep up to date. We review the Office 365 plans and then take a deeper dive into some of the new products in the Office 365 suite including Delve and Clutter. For resellers we talk about the Microsoft Partner Network and what resources are available. If you want to learn about the latest with Office 365 as a customer or reseller, this is a not to miss episode. 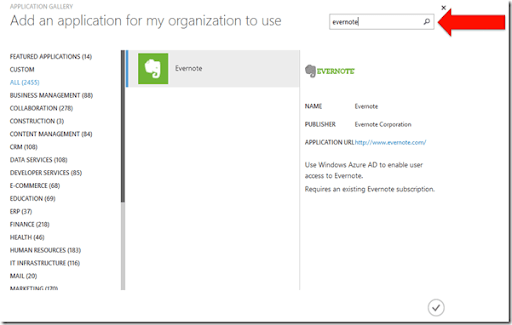 In a previous blog post I show how to enable your Office 365 Azure AD. 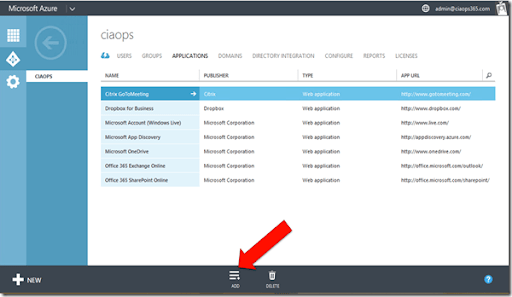 Once you have access to Azure AD you have access to the free version of Azure AD. Amongst other things this allows you to manage user accounts, synchronise with on premises directories and get single sign (SSO) on across Azure, Office 365 and thousands of web based applications. 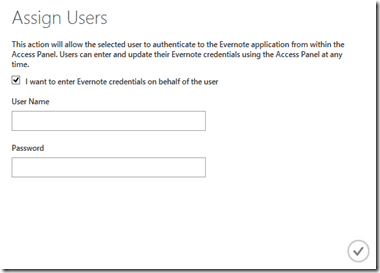 To set up this SSO portal you will need to login to your Azure AD as an Office 365 global administrator. Select Active Directory from the menu on the left and the name of your Active Directory. That should display a screen like that shown above. From the menu across the top select the Applications option. This will list any pre-configured web apps. If this is the first time here you will probably see that both Office 365 Exchange Online and SharePoint Online have been configured for you. To add a new application to the SSO portal select the Add button at the bottom of the page. Next, select the option to Add an application from the gallery. You should see that there over 2,400 apps currently that you can select from. 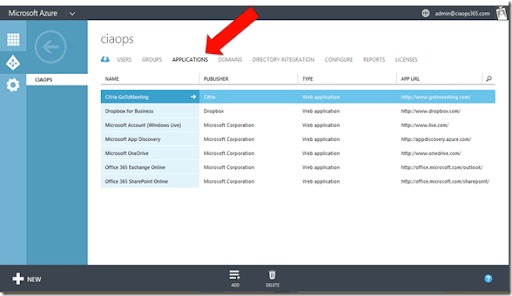 The easiest way to locate app you want to integrate into your SSO portal is by using the search features in the top right. Here, I’m going to integrate Evernote, so I simply select the icon in the middle of the page once I have located it in the list. 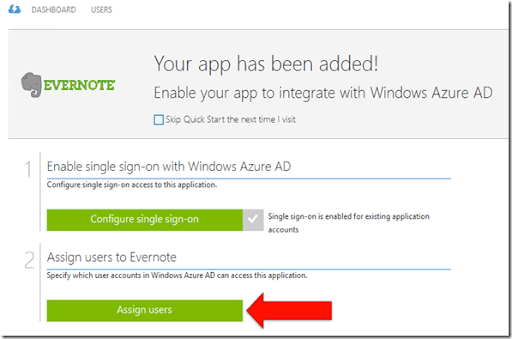 Different applications have different configuration requirements but in this case with Evernote all I need to now do is assign which users need to access it. I do this by selecting the button Assign users. This should now take you to a list of users (here, my Office 365 users). Firstly, select the user you wish to assign the app to and then press the Assign button at the bottom of the page. This will now prompt you to enter the app login credentials you wish to have for the user. Enter these and select the check icon in the lower right corner. You should now see that user has a Direct assignment for that app as shown above. 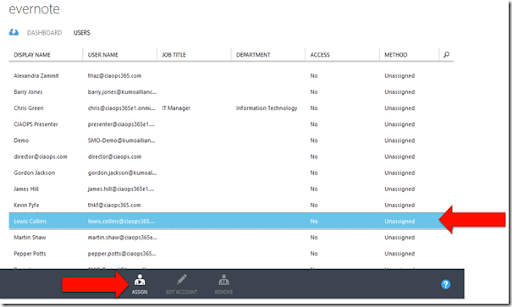 and because we can connected our Office 365 directory to this SSO they can login using their usual Office 365 credentials but now they will only need to do that to access all their web based applications you have configured for them. Once a user logs into the SSO portal they will see all the apps that you have configured for them. To access any of these they simply click on the icon. In this case, if I click on the Evernote icon I just configured a new tab in my browser will automatically open and I will be automatically logged into the application using the credential entered at the configuration stage. So that’s the basics of what’s included for free with Office 365, Azure and the single sign in portal. Is there more that you can do? Sure is, but that will have to wait for an upcoming blog post. 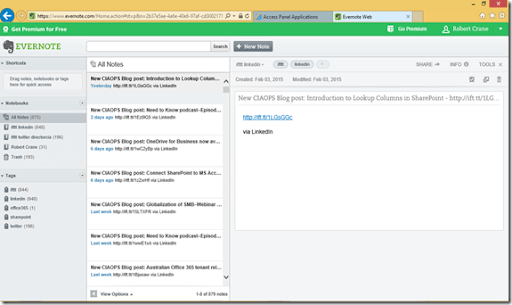 SharePoint has the ability to act as a basic relational database. Thus, you can create one list that if referred to by other lists. This means that you can maintain only a single location for all your information. The most basic method to achieve this is by using Lookup Columns. This tutorial will show you how to create a lookup column in a new list and then how to work with the information. You’ll see how to add and update information as well as edit the column headings in the new list so they present better. This video is another in my Intermediate SharePoint series that you can follow through. Of course don’t forget my Getting Started with SharePoint series which you also get via email or download and install on your own SharePoint Team Site. You can subscribe to the free Getting Started with SharePoint lessons by entering your email below. I’m joined by an old friend, MVP Mark O’Shea to talk reseller opportunities in the Microsoft cloud. We especially look at products like Azure and Intune. Mark gives us his experience and knowledge about really getting into Azure and how it can make a real difference to your business and your customers. Mark spells out how import Azure is becoming and why resellers really need to start looking into what solutions it can provide from them. You’ll also hear more about Intune and role that it can play when coupled with Office 365 and Azure to provide an overall management solution.